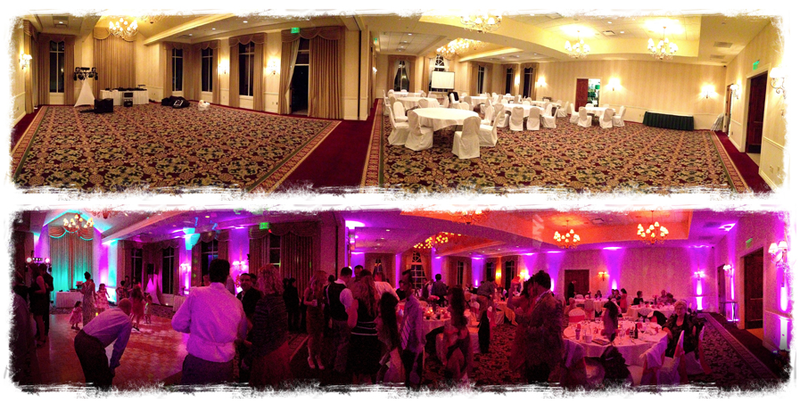 Uplights, Cameras & Shells, Oh my! Piano Shells – Full Sized Grands! If you’ve ever been to a Howl at the Moon or Shout House Dueling Piano Bar, if you look at the pianos really closely, you’ll notice that they aren’t real. In fact, these pianos are nothing more than “shells”, wooden boxes that look like real pianos, but are empty inside. It makes sense though…who wants a drunk guy to spill his beer on your grand piano? 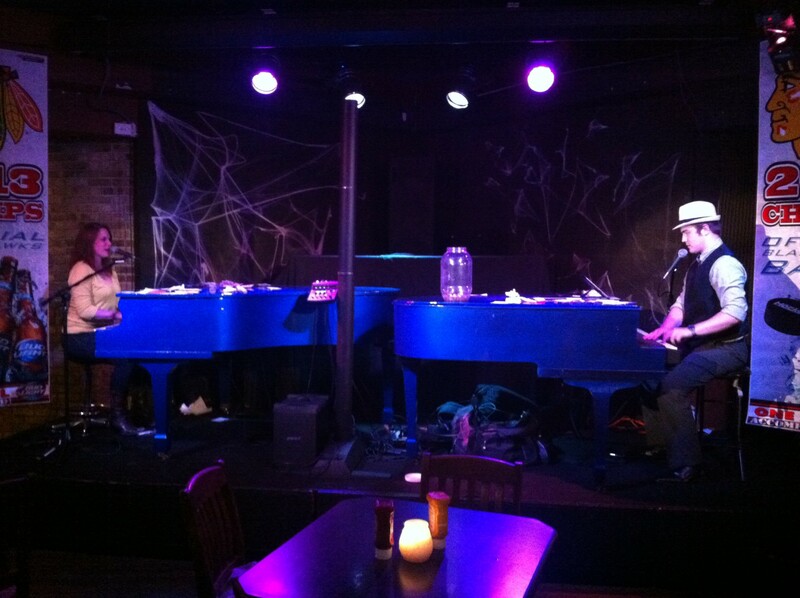 Piano shells have a ton of benefits in the dueling pianos world, and Felix and Fingers are proud to say they have some of the best shells available. As with any product, quality can vary. Don’t go to McDonalds expecting a steakhouse quality hamburger. 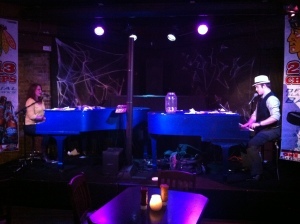 The analogy applies to dueling pianos as well. Where as most companies use shells made out of cardboard, cloth, or plastic, our shells are the real thing. Fingers personally bought two grand pianos (Thank you Piano Trends in Crystal Lake! ), gutted them, and had them professionally painted. These are as close to real pianos as you’ll get! Piano shells add to the look of any event. They won’t make us play or sound any different, but there is a definite “wow” factor when your guests walk in to two grand pianos on stage. 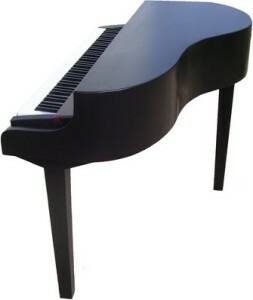 And these pianos can fit though any door, so any venue with about 16′ x 10′ of stage space can accommodate the shells. We currently only have one set of shells though, so if you’re interested, be sure to act fast! If the big shells are just too big, F&F offer a smaller set up utilizing mini piano shells that fit in our vehicles. Because we don’t need a trailer or have the usual travel difficulties, these shells are about 70% less expensive than the full shells! At about 3 feet long, many people still mistake these for real pianos, and they look infinitely better than two keyboards on stands. These can be added to any event and practically take up no extra space. These 100% wooden shells have a gloss black finish and will easily class up the presentation. People hear with their eyes! 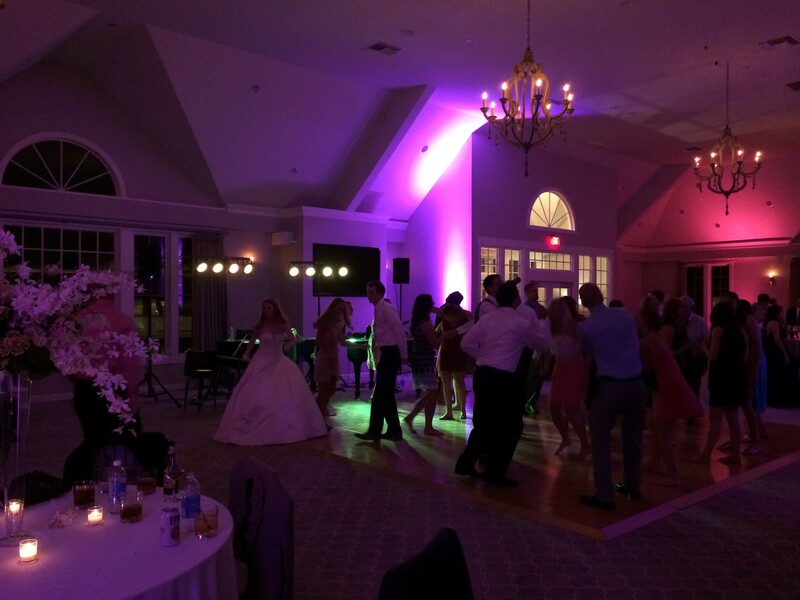 One of our most popular add-on options are uplights. Uplights are just as the name implies: lights that point up. These are used to project color up a wall and create a pillar-of-light effect that can drastically change the look of a room. Felix and Fingers have a set of 8 uplights available. These can be set up anywhere with a power outlet, and can be split up as needed. Each uplight also offers about 14 color options, offering our clients the opportunity to light the room according to a theme. Check with your venue if you’re interested in uplights as many venues will provide this option, however our prices are likely significantly lower. For the most cost effective way to make a room look immediately stunning, add uplights! Projectors and Projector Screen: Montage! Some events have multimedia needs, so Felix and Fingers offer a Projector and Screen package. This is a perfect option if one of your guests has put together a slide show of embarrassing moments (Weddings or Mitzvahs), or you have a video to support a fundraiser, or maybe a corporate presentation. Our projector can be plugged into our sound system as well, meaning all your audio needs will come through our professional speakers. For files, there’s just one simple rule: If we can play it on an iPhone, we can project it! Send me your file(s), and so long as I can play it on one of my portable devises, it is beautifully simple to turn your project into a wonderful presentation. If you’re interested in booking, please reach out! Likewise, projectors are great for events with modest guest numbers (our screen isn’t large enough to cover a 500 person event), so let us know if you’re considering this option. Howl at the Moon has a concept where almost all of their shows feature two pianists fronting a 4 piece band, complete with drums and guitars. At Felix and Fingers, we don’t need a full band to get your party dancing, but if you want the groove of a live drummer or extra musicians, we will make it happen. When it comes to adding musicians, the prices can range greatly depending on the time frame needed and distance traveled. Call or email to discuss your vision and we’d be happy to quote out extra players. Typically, we’d recommend first adding a drummer to the dueling piano set up (without one, we play drums via our keyboards to encourage dancing). Then, if you still want more sound, a Guitarist or Bassist would be a great option, followed up with a Saxophone. Keep in mind though, more space will be required with each additional musician, so make sure your venue has the room! All our add-ons are subject to availability. Please reach out early if possible to reserve them for your wedding. And if you don’t see an option listed here, just ask. We’re always looking for new ways to provide great experiences for our clients. And if you have a great idea that we’d like to try, perhaps we’ll be able to try it out at no cost! Felix and Fingers strives to offer the best wedding entertainment/corporate events available and we always encourage your ideas and input. 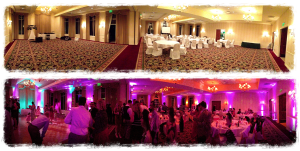 We look forward to working with you and executing your perfect event!